Netherlands 4-193 (Stephen Myburgh 63, Tom Cooper 45, Wesley Barresi 40, Kevin O’Brien 2-29) beat Ireland 4-189 (Andrew Poynter 57, William Porterfield 47, Ahsan Mailk 2-26) by six wickets. A stormy innings from the Netherlands batsmen complimented by a rain of sixes and especially the thrilling knock from Stephen Myburgh destroyed the Irish team. The Irish men scored 189 for the loss of four wickets in 20 overs and the Dutch Team blasted 193 with six wickets intact and 37 balls to spare. Stephen Myburgh (Netherlands) was declared ‘Player of the match’ for his attacking knock of 63 from 23 mere balls. The ICC World T20 – First Round, Group B, match was played on Friday, March 21, 2014, at Sylhet Stadium. Earlier, Peter Borren, the skipper of the Netherlands, won the toss and invited Ireland to bat first. The first wicket was gone at 28 when Ed Joyce joined with his captain, William Porterfield who was hitting the ball nicely. The latter was clean bowled by Ahsan Malik at 69 for 47 and was replaced by Andrew Poynter who was dropped at just two runs. Joyce was run out 19 runs later for 28 as Kevin O’Brien who started giving proper assistance to his partner. Poynter attained his fifty on the 27th delivery and O’Brien was hitting the ball out of the rope frequently. The first was dismissed on the final ball of the 20th over for 57 off 38 with 4 lofty sixes and even fours while Kevin O’Brien was at the other side at 42 as Ireland reached 4-189. Ahsan Malik was the top wicket taker with two whereas Timm van der Gugten got one. The Netherlands required 190 runs in 14.2 overs to book their place in the top 10s. 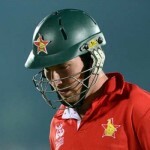 Peter Borren along with Stephen Myburgh took off briskly by smashing 68 in just four overs with 8 towering sixes and 3 fours. The latter powered his half century on the 17th ball and the partnership was dislodged at 91 when Borren was dismissed for 31. Myburgh followed him seven runs latter for 63 off 23 with 7 sizzling sixes and 4 fours. Wesley Barresi and Tom Cooper took over from where it was left by the openers and the latter dispatched 4 sixes in the 11th one. Cooper went back to the pavilion at 161 for 45 from 6 huge sixes and 1 four while target was being kept in mind by his partner. Barresi hit the winning six on the fifth ball of the 14th over and remained unbeaten for 40 as his team rushed to 4-193. 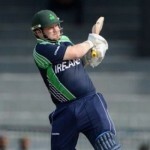 Kevin O’Brien was the highest wicket taker with two whereas Tim Murtagh and George Dockrell shared one wicket each. Netherland won the encounter with a margin of six wickets and qualified for the main round.